Something like this, I can see some mid brown heeled boots. Yeah I know, heels sue me. She would at least look modern, stylish, and Lara like. Last edited by tlr online; 09-02-19 at 07:16. Reason: Images removed. See FAQ on posting images. The horrible, oversexualized shorts. Completely humiliating for an intelligent, strong, independent woman. Just kidding, I don't care. She can wear whatever. 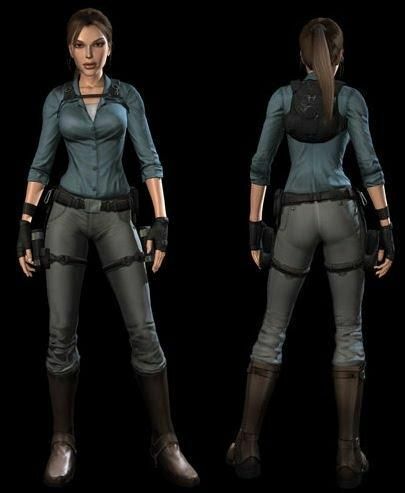 I'd love something like the casual explorer outfit in Tomb Raider Underworld. I'd also like Tomb Raider Underworlds backpack to return, as I always loved the strap across her chest that ensured it remained attached to her and how it held her flashlight. I really think it would suite the practicality of reboot Lara. I loved this outfit. I prefer a khaki color pant. I want the Blue Heron Tunic to be the main outfit in the next game. It would be such a cool callback to the reboot trilogy, as this is clearly her most iconic look up to this point. It would also be cool to have the option to fast travel back to Paititi! And while the whole place would remain unchanged (meaning, every single NPC would still act as if Amaru was alive and the Apocalypse is about to set in, as an easter egg), Lara would finally become the tribal Princess she was always meant to be. But it would be only logical to do so while wearing the Blue Heron Tunic, so the only other outfit options would be the Blue Heron Tunic in different colour variety, or perhaps even a few added animal bones and squirrel tails as a bonus! This way everyone could be pleased! This post is restricted outside Paititi. I want the Blue Heron Tunic to be the main outfit in the next game. It would be such a cool callback to the reboot series, as this is clearly her most iconic look up to this point. Last edited by Yeauxleaux; 13-02-19 at 09:18. Why didn’t I think of this? This would save Tomb Raider. Your mind! You snapped with this idea! My signature was removed because it was vulgar. Now I can't choose my own till March 2014. If I edit this one I will be suspended till March 2014.